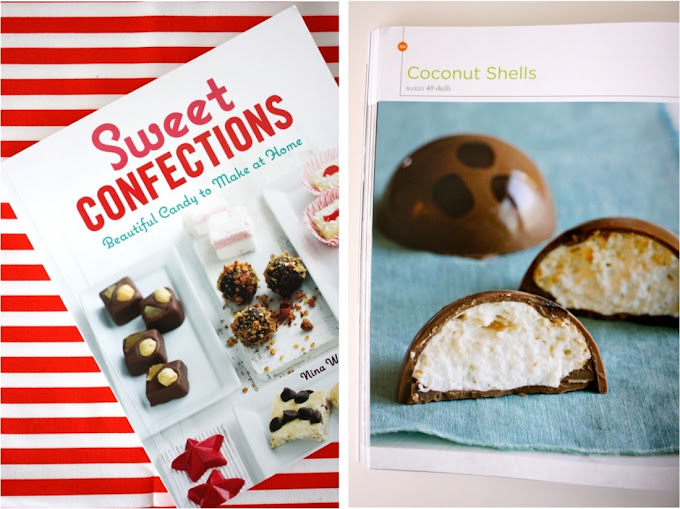 Today we're giving away 2 copies of the scrumptious book Sweet Confections: Beautiful Candy to Make at Home. Read my full review of the book HERE. * Leave a comment in this post, that's it! * Leave your EMAIL ADDRESS in your comment, which may be written as: dana (at) hotmail (d0t) com, if you're worried about leaving your real address in cyberspace. * If you forget something and need to leave a second comment, go back and DELETE your first comment (click on the little trashcan icon in the corner of your post). * Giveaway ends, Friday 2/3/12 at 10pm (Central Time). Winner will be announced on Sunday. ooh wow...just in the pictures you show here, i see at least 4 recipes i already had on my "to make" list on pinterest :) i certainly would love a copy! This book looks so fun! It would be great to make them or a great gift for a close friend. Yum. This book looks delicious! Wow, I have never made candy like that. Thanks for the chance. yum, Yum, YUM!!!! :) Hope I win!!! What a fun and cute book! Yum! This is darling! I love sweet things and I love pictures of food. This book would be going to a good home if my name is drawn. Thanks for posting the Giveaway Dana! I would LOVE to win. I have such a big sweet tooth. These all look so delicious! I have a serious sweet tooth and would love to try my hand at making candy. I would love to win this!!! Yummy! Oh YUM!!! those look fun to make... Thank you for the chance to win! I would love to win this. My oldest son is into baking treats for all the girls in his Ballet class and he would love to make some of these for those little girls. Would love love love to win this book! These all look amazing ...... and delicious, a lethal combo. Great work! Oh, my. Salted chocolate covered caramel lollipops? I'm glad I passed my 3-hr glucose! The book looks delicious. I can't wait to get started. My 12 yo daughter would love this also. please, oh please! Would love it. Yummy! I'm on a diet, but these look scrumptious enough to splurge a little. YUM! Looks like so much fun! wow, that book looks awesome! I want a copy!! 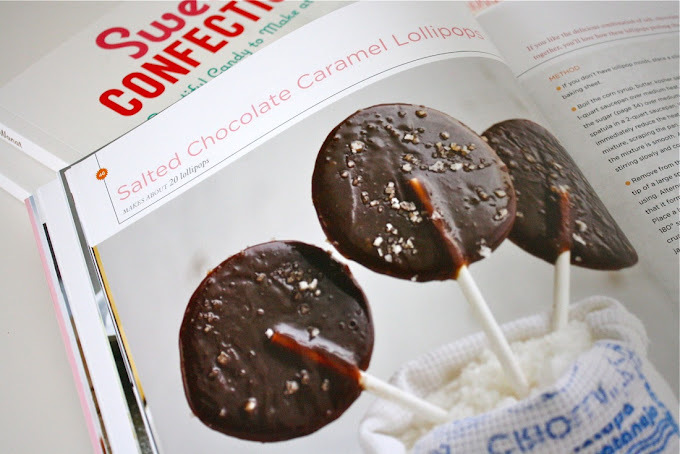 I need to make those salted chocolate caramel lollipops!! Wow. This book looks amazing! Yummy...all of it looks so good! I love to make goodies like that! I would LOVE to win a copy of this book! That book looks awesome! I pin a lot of sweet treats too, but don't dare make them all because I wouldn't be able to resist eating. If you look really closely, my name is written all over one of those copies! This is right up my alley! I just made my own chocolates - the maple walnut ones from the sweets and treats - and I loved it. I would love to learn how to do more. I certainly shouldn't enter this contest... but I sure hope I win! Beautiful photography! Thanks for a fun and practical giveaway . . . I also love sewing and baking! Delicious! I'd love a copy! I'm torn between loving and hating the yumminess of all those photos. That. Looks. AMAZING! Looks like there's a scrumptious recipe to satisfy each of my sweet "tooths"! I'm in the final stretch of adult braces and those caramels are killing me!!! Oh my gosh! That book looks amazing! I would LOVE to win it!! My sweet tooth (and boys) will thank you if I win! This book looks delicious. OOOhhhhhhhh yum! I want to make them all!! I think all the things that I have seen in this book look absolutely Wonderful, I sure would like to create some of them. Ooh everything looks so yummy!! i would love to try these recipes. Oh I think I must have this cookbook! They all looks so delicious. I would love to try some recipes out. I would absolutely love to make those homemade marshmallows! oooo....i really want to learn to make a marshmallow. yum! This would be amazing for Valentines day! My husband and I's 3rd as husband and wife and our first as parents! ohmygosh! that book looks right up my alley! i would LOVE to make some treats for my family. happy love day to you & yours! Oh my, everything looks so tasty, and I do love making candy! That looks like a great book to have! This book looks gorgeous! I love making sweet treats for gifts for the holidays. OOOO! Candy making is such fun! Ooooolalaaaaaaaaaaa looks like a beautifully delicious and fun book to win!!! everything looks so yummy! i've always wanted to try making candy! This would be great to try! Ooo I'm excited! I hope I win. This might just take my baking to a whole new level! My son (5 years old) was sitting next to me as I was looking thru your review and made me click on every.single.picture so that he could take a closer look; then he would explain, "Mommy, I think you need to make THAT!" Ha. "Yup, I think I do." I'd love to add this book to my collection. 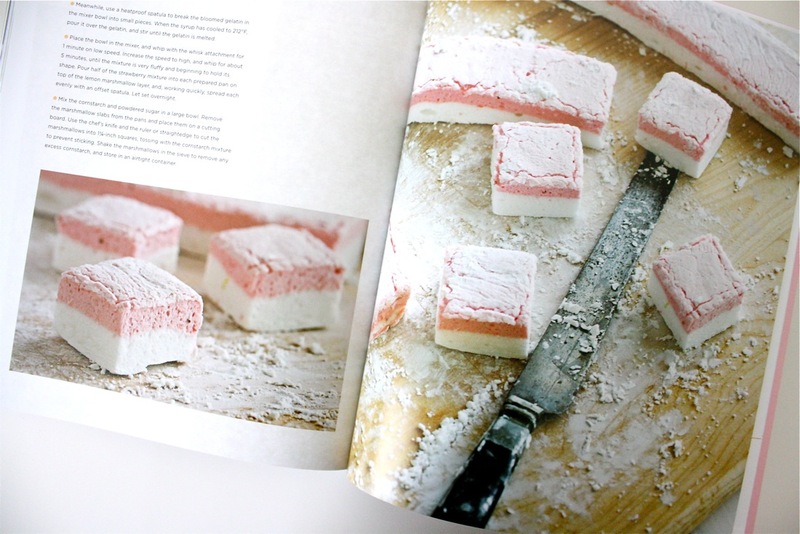 Mmmm, this book looks good enough to eat! Thanks so much for the give-away!! Oh boy, those truffles are calling my name! I would love this book. Yum, yum, YUM! Thanks for the giveaway! Treats are so fun, aren't they? What a pretty book! I love sweets (as my rear end can attest!) and I'm always looking for new recipes to try! yum I can always go for something sweet! thanks for the giveaway. Oh good gracious! I'm literally salivating at those pictures. [swallow]. Thank you for the chance to win this incredible book! I want to make all of these!!!! Looks delicious and fun. oh man. I am drooling all over my keyboard. Those treats look so yummy, I am crossing my fingers for a win, my candy thermometer is begging to be put to work. These pictures are gorgeous! Makes me want to throw some flour around and bake! I adore beautiful pictures of food-especially sweets. Thanks for the giveaway! i really don't need it, but i'm pregnant and all those pictures look so good!! This is definitely not helping me eat my healthy lunch. Truffles are so much more fun. mmm so yummy!! Hope I can start making some sweet treats soon! thank you for the give away! This looks amazing! Thank you Dana for your awesome blog! Everything looks scrumdiddlyumptious! Thank you for the chance to win! Looks like an amazingly delicious book!!! Ugh! hopefully this one shows up! Delicious and beautiful. What a mouth drooling book! Oh wow...I can only imagine how happy my husband would be to get this book. He has such a sweet tooth and LOVES to bake. Oh, and this would save me a ton of money at the candy store! Over heeeeerrreeee !!! I know some little mouths who would love that !!! Oooh homemade marshmallows, I love them! Everything looks soooooo yummy!! Thanks for the giveaway!! Oh my, I'm drooling just looking at the pictures!! I would love this book! Thanks for the great giveaway! Those are evil!!! Now I want to take my son out and run to the chocolate store! Oh to be "WINNING" this book!!! Is it wrong to care about sweets this much? 115 other comments prove it's not. Thanks for the chance to win! Candy and desserts are my favorite! I'd love to try some of these. Thanks for the giveaway! Looks amazing! I am such a sweetaholic and these look so good to try. Thanks! Wow! What a fun book. This book looks amazing. I would love to have some good candy recipes. I would love to look through all the gorgeous pictures, and try out some of those recipes! And to think i'm swearing off sugar on my BIRTHDAY! Gasp! I might have to take those words back. LOL! my dentist would love it, almost as much as i would, if i won. Ooh, this would be fun to have. I don't make a lot of treats but I should start, right? Wow! It all looks great. Candy seems so intimidating to make, but I'd love to learn how to do more homemade! It all looks so tasty good! Looks amazing!!! Would love it! Dang....and I was doing soooo well at avoiding sugar this year. Gotta have that book now!!! Looks. So. Gooood! Would be quite an accomplishment to make goodies that look as good as these. Thanks for sharing this sweets book! In the words of my three year old, "ooOOoo, wet's taste it!" I've been wanting to make homemade marshmallows for a while now. This book looks amazing. I hope I win. I would love this book! I make caramels and taffy but that is as far as I've ventured in candy making. I'd love to have some new recipes to try out! Wow! That book looks SO fun! Oh boy... I would love to make all of the things in this book! The closest I get to making candy is caramel apples. Today I made heart shaped jello jigglers but I think it would be nice to try something a little bit harder! My family will love these treats! would love to try some of these recipes. i'll get a book if i don't win. those pictures are making me hungry!! This book looks amazing! I've never made anything like this, but would love to try! Yes please! I'm not on a diet! My new year's resolution was to only eat the junk food I make. I was thinking french fries and ice cream but candy definitely fits this mold! Yummy treats! I love love love making treats to share. Almost all my family has a sweet tooth, this book would be the go to book when making birthday treats. This looks so fun. Thanks for the chance to win. Can't wait to get this book! I want to try my hand at the salted caramel lollipops. This book looks so fun! !